Rascarrel Bay Lodge 2 is one of four spectacular lodges that are set in an elevated position and look out over truly wonderful panoramic views. Each lodge has been expertly designed to provide luxurious, comfortable accommodation that really makes the most of the beautiful setting. Arranged around a large, secluded bay and right at the seashore, but still close to plenty of amenities, the lodges are perfectly located to provide the ultimate, convenient rural getaway. Perhaps best of all, the lodges all have a private, enclosed balcony with hot tub, making these fabulous lodges an idyllic place for a romantic retreat in this splendid region. 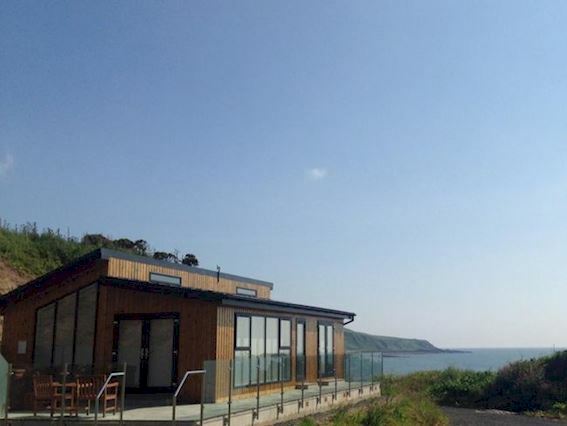 Built with the utmost luxury in mind, the lodge consists of one king sized bedroom that boasts spectacular sea views, a flat screen TV with Freeview and an iPod dock. Patio doors lead out directly onto the enclosed balcony, which is a perfect spot for a sunny morning coffee or evening drink, basking in the stunning surroundings. There is a large bathroom with a bath and separate shower, two sinks and a WC. There is also an additional separate WC. The living area is open plan and spacious and has a large flat screen TV with Blu-ray and DVD players, Freeview and a feature fire. It’s a great space, and is great for relaxing in on chillier evenings or when the weather is less than ideal. General amenities include: a wine cooler, gas oven and hob, fridge/freezer, microwave, dishwasher, a washing machine and tumble dryer. There is a beach on site, and a shop/post office two miles away. Larger shops are located eight miles away. There is ample off road parking. Towels, bed linen, electricity, central heating and Wi-Fi are all included in the rent and welcome pack with kitchen/toiletries essentials is provided. Please note: the property is not suitable for children over six months in age. No pets. The lodges are situated in such an ideal place that guests may well struggle to leave them! If they can tear themselves away however, the charming village of Auchencarin is just two miles away, and the surrounding area offers numerous fantastic attractions and sights to discover. Visitors will love wandering around Broughton house and gardens, or admiring one of the many impressive castles in the region. Learn about local history at the Robert Burns house and museum, or take part in some adrenaline fuelled water sports on Loch Ken. For a more relaxing day spent admiring the lovely views, there are also lots of golf courses in the areas, including Colvend, New Galloway & Dalbeattie.